A sign appealing to people not to use a North Mymms public footpath as a toilet appears to have been removed. And the problem of human excrement and soiled toilet paper continues to present a health hazard. The sign was put up by a member of Hertfordshire's Countryside and Rights of Way team who visited the footpath again last week to assess the ongoing problem of human faeces alongside the public right of way. 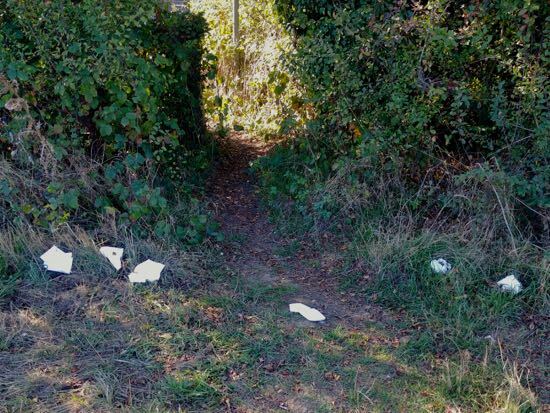 A check on the area this week confirmed that the plea has been ignored, and the area is again strewn with more used toilet tissue and human fouling. The footpath, which is identified as North Mymms 66, is opposite the Esso petrol station, and runs from the south-east junction of Woodside Lane and the A1000 in Bell Bar over towards Grubbs Lane. Grid reference TL 25283 05421. The excrement is visible to the left and right as walkers cut through the hedgerow and enter the field. The area is popular for walkers following several circular routes on the Hertfordshire Walker site. 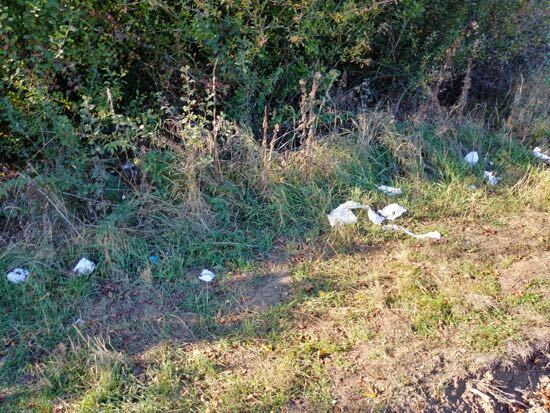 Police and officials from Hertfordshire County Council have visited the site on a number of occasions and spoken to people suspected of using the hedgerow as a toilet. The last time the issue was raised on this site officers said they would return and have further words.